RadScheduler includes support for recurring events on hourly, weekly, daily, monthly and yearly basis. Exceptions to the recurrence rules are also permitted. To support this recurrence behavior, the Appointment class includes the RecurrenceRule, RecurrenceParentID and RecurrenceState properties. When an appointment is promoted into a recurring event its RecurrenceState changes to RecurrenceState.Master and the RecurrenceRule is populated with the string representation of the recurrence rule. The recurrence master is stored in the database and its occurrences are generated on the fly with RecurrenceState set to RecurrenceState.Occurrence. The maximum number of generated occurrences is controlled by the MaximumRecurrenceCandidates property of the RadScheduler which has 3000 as the default value. If the user modifies an individual appointment occurrence, this creates an exception. The RecurrenceRule of the master is modified to include the date and time of the exception so that no occurrence is generated for the exception occurrence. Then the exception is stored in the database and its RecurrenceParentID property is set to reference the original master. This way the exception is still linked to the original recurrence series. Using the specialized classes makes it easier to define recurrence rules because only relevant parameters are specified in their constructors. // Create a sample appointment that starts at 6/1/2007 3:30 PM and lasts half an hour. 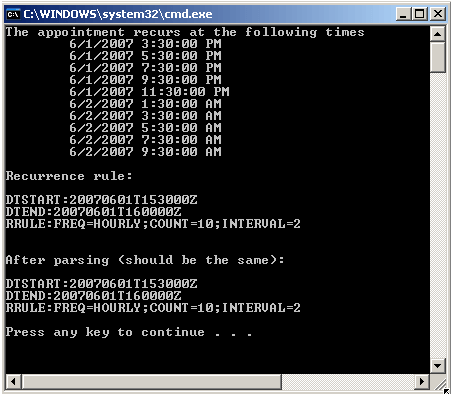 // Create a recurrence range, that specifies a limit of 10 occurrences for the appointment. // Create a recurrence rule to repeat the appointment every 2 hours. // The string representation can be stored in a database, etc.
' Create a sample appointment that starts at 6/1/2007 3:30 PM and lasts half an hour.
' Create a recurrence range, that specifies a limit of 10 occurrences for the appointment.
' Create a recurrence rule to repeat the appointment every 2 hours.
' The string representation can be stored in a database, etc. The RecurrenceRange class specifies the time frame for the recurrence. It consists of the start timeof the event, it's duration and optional limits. The Occurrences property returns an enumerator that can be used to retrieve all the occurrences defined by the rule.